IN THE BEGINNING, EVERYTHING WAS ALIVE. THE SMALLEST OBJECTS WERE ENDOWED WITH BEATING HEARTS, AND EVEN THE CLOUDS HAD NAMES. Having recalled his life through the story of his physical self in Winter Journal, internationally acclaimed novelist Paul Auster now remembers his development from within, through the encounters of his interior self with the outer world. 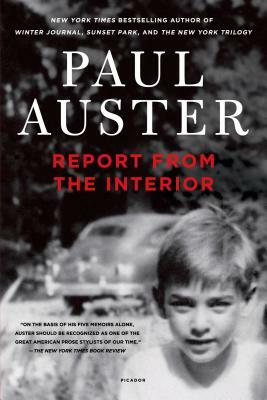 In Report from the Interior, from his baby's-eye view of the man in the moon to his dawning awareness of the injustices in American life, Auster charts his intellectual, political, and moral journey as he inches his way toward adulthood from the postwar fifties and into the turbulent sixties. He then recapitulates that journey through an album of pictures, answering the challenge of autobiography in ways rarely, if ever, seen before.